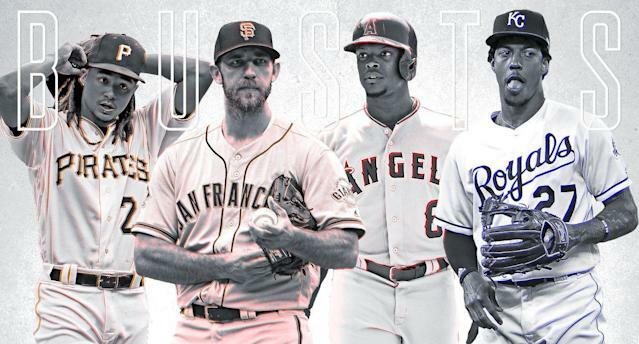 Who should you avoid in 2019 fantasy baseball drafts? We offer one player from each MLB team. Bust is a harsh term, and please don’t get offended if I name someone who’s on your own fantasy team (remember, I’m contractually obligated to pick one from every MLB team). The following players are overvalued, whom I’m fading at their cost. For a look at my sleepers, check them out here. The strikeouts are nice, but Ray’s control has gotten worse every year he’s been in the league. His BB% and Hard Hit% both ranked in the bottom 5% of MLB last season. The humidor helped, but Chase Field remains a hitter’s park, and he’s going to be a WHIP problem. A beloved prospect for years, Gausman produced a 2.87 ERA and 1.14 WHIP after getting traded out of the AL East last season, generating some positive buzz entering 2019. But the underlying stats didn’t suggest a huge breakthrough. Atlanta’s park has been hitter-friendly over its first two years, and worse yet, Gausman has struggled this spring while dealing with shoulder inflammation (like the rest of the Braves’ pitching staff). A former top-five pick, Bundy is coming off an ugly year but is still young enough to create optimism for a bounce back. Unfortunately, he’s been getting destroyed this spring, the A.L. East remains the toughest place to pitch, and Bundy’s FB velocity continues to decline. While Price enters the year with a cheaper price tag, there are more concerns for further decline, as his fastball velocity dropped another 1.6 mph last year, when he finished with a career-low mark (his FB produced an anemic 5.2 SwStr%). It’s not an ideal situation while pitching in an extreme hitter’s park. He somehow posted a 3.32 ERA despite an 11.2 K-BB% mark that ranked bottom-12 among starters who qualified last season. Lester’s ADP suggests fantasy owners understand his FIP (4.39) was more indicative of his pitching, but they are still talking themselves into him at a “discount.” Don’t buy the 35 year old when better SP options surround his ADP. He certainly impressed with a .405 OBP, but all of Winker’s walks do fantasy owners little good in standard formats, so he’s being overrated right now. Don’t expect much more than 15 homers, and he’s a near zero in steals. Winker is often getting drafted ahead of Ryan Braun and Kyle Schwarber, which is crazy. His fastball velocity has declined five straight seasons, and he produced far fewer swings and misses with his curve last year. The 32 year old is still terrific but clearly in the decline phase. Andy Behrens is still buying, but I’m passing on Klubot. He posted a 2.61 ERA and a 1.00 WHIP with a 124:20 K:BB ratio over 93.0 innings after the All-Star break last season, setting a franchise record in strikeouts with 230 on the year. While his first half 4.81 ERA is of some concern, the bigger worry with Marquez is having to pitch in Coors Field, which has increased run scoring by an MLB-high 33 percent over the last three seasons. The second-best offensive park in the National League over that span has increased run scoring by five percent, so the Coors factor can’t be overstated. No player on last year’s list in this column produced more venom than Anderson, who threw it in my face with a 20/26 campaign. Of course, that also came with a .240 BA (and a .271 xwOBA that ranked in the bottom 5% of MLB), and while his plate discipline improved, it was still ugly (149:30 K:BB ratio), and his SB success rate finally dropped. Anderson hit .235/.251/.393 after the All-Star break last season, and he remains on my avoid list. This is a low-hanging fruit after he posted a 5.12 ERA last year, but Greene enters 2019 as Detroit’s closer and is being drafted as such. THE BAT projects a 4.21 ERA with a 1.35 WHIP for Greene this season and a 2.85 ERA with a 1.07 WHIP for Joe Jimenez, whom I’ve ranked as Detroit’s top fantasy reliever. Sticking with THE BAT, which isn’t buying Miley’s run in Milwaukee last season and projects a 4.65 ERA and 1.46 WHIP for the lefty. Calling an extreme pitcher’s park his new home, Miley is erroneously being called a sleeper by some. Worse yet, he’s being drafted before superior options such as Joe Musgrove, Michael Pineda and Jimmy Nelson. I’m also fading Alex Bregman at his ADP, preferring to draft Trevor Story, Javier Baez and Freddie Freeman ahead of him. Steals are hard to come by, and it’s easy to get excited about a young player who just went 14/32 in only 275 at bats, but Mondesi is a real batting average risk with his lack of plate discipline (77:11 K:BB ratio last year). His power/speed combo is certainly enticing, but Mondesi has a short track record, is a legit threat to hit in the .230s, and his counting stats will suffer from hitting in one of the worst lineups in baseball. You can get similar production from Jonathan Villar at a cheaper cost. He’s on the wrong side of 30, doesn’t run much anymore and could easily hit in the .240s in a park that crushes batting average. Moreover, Upton has been slowed throughout spring while dealing with patellar tendinitis in his right knee, which could be something that lingers. Jansen led all of baseball in K-BB% from 2014-2017, but a noticeable drop in velocity last season led to the highest ERA and the lowest SwStr% of his career. Of course, a 3.01 ERA (and 13.5 SwStr%) is still plenty good, and saving games for the Dodgers is a great setup, but Jansen is coming off heart surgery, and it’s a condition that’s obviously serious and could creep back up at any moment. The continued decrease in velocity and effectiveness of Jansen’s fastball is especially worrisome given he throws the pitch almost exclusively (94.2% of the time last season). There’s an unusually high-risk factor for the No. 2 RP off the board in Yahoo leagues, so Jansen’s a pass for me. I also wouldn’t draft Clayton Kershaw in the 60s on a bet. The concept of being a “bargain” is relative. You laugh at my cowardice picking a bust here but the joke’s on you my friend, as I chose the Marlins player with the highest ADP; it’s not easy coming up with someone overvalued on a roster filled with players no one wants. Alfaro is a nice catching prospect who gets a chance at a full-time job now as part of the J.T. Realmuto deal, but Steamer projects a 10-35-41 line, and Alfaro’s 23.4 SwStr% last season would’ve lapped the field by a mile had he qualified, so BA is going to be a major problem, especially since Marlins Park has been the best pitcher’s park in MLB over the last three seasons. Although he didn’t benefit from the change in home parks as expected, Cain turned in a strong fantasy season during his first year in Milwaukee, but he’ll turn 33 soon and isn’t too far removed from having real durability concerns. Moreover, among the bottom-100 players on the Barrel% leaderboard, Cain owns the highest ADP, and his launch angle dropped from 10.1 degrees in 2017 to 4.9 last year. Fewer extra-base hits may continue to be in his future. He has four homers and three steals with a 1.450 OPS this spring after gaining 21 pounds of muscle during the offseason, so last year’s bum has been climbing draft boards as Opening Day approaches. 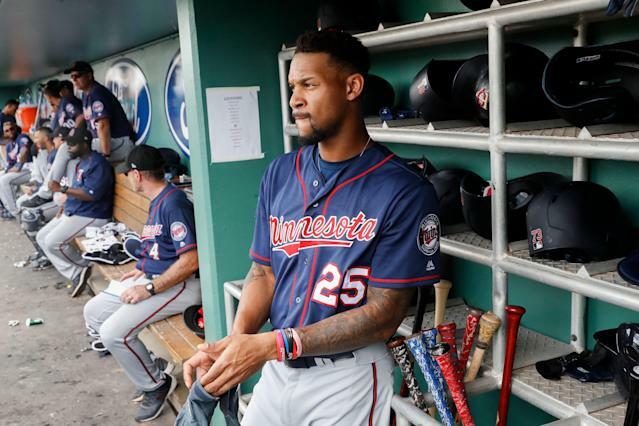 Don’t forget the incredibly injury-prone Buxton also posted an unheard of -3 wRC+ last season, so a .230ish BA and weak counting stats should still be in store even if he’s able to somehow stay healthy and show marked improvement at the plate. He was a solid addition by the Mets, but Ramos is being over-drafted in fantasy leagues (his ADP is similar to Yadier Molina and Yasmani Grandal). In 416 plate appearances last year, he scored 39 runs, and that was with an inflated hit rate (the difference between Ramos’ batting average (.306) and xBA (.262) was the seventh-biggest in baseball). I had Severino as a top-five pitcher this year until he suffered rotator cuff inflammation, and now I want no part of him. GM Brian Cashman says May will be the earliest he returns, and the bigger question is what version of Severino do we get if/when he does. There’s also at least some concern with Giancarlo Stanton’s power, given his launch angle trend. He finally turned in a positive performance last season after continually failing to live up to expectations, but now Profar goes from a park that’s increased run scoring more than any other than Coors Field over the last three seasons to a pitcher’s venue in Oakland. The change in homes should have an equally negative impact on power for the switch-hitter as well. I’m sure no one will be bothered with me putting Pivetta here, as everyone’s favorite pitcher is a popular target this year. But the Phillies’ already poor defense (they finished last in UZR/150 last year) added Bryce Harper during the offseason, and Citizens Bank Park is about as homer-friendly as it gets, so don’t be surprised when Pivetta’s ERA once again doesn’t match his superior peripherals. There’s also concern his control regresses, so let someone else reach for Pivetta. It’s best if fantasy owners forget 2015 happened with Archer, as that’s his clear outlier, and while strikeouts remain plentiful, he allowed eight homers over just 52.1 innings in Pittsburgh after moving to the N.L. and a park that kills HR for RHB. It’s not easy working through the lineup three times, being a two-pitch starter. Imagine how disappointing his ERA would be had he not played his career in pitcher’s parks. He went to the disabled list three more times last year, as his old durability problems returned (he’s been limited to fewer than 90 games in three of five seasons since his abbreviated rookie year). He’s never hit .260 (or scored 100 runs or recorded 100 RBI) in his career and still has to deal with Petco Park and a low-scoring lineup around him. Myers’ ADP is just too high for someone with his injury risk. He’s coming off a season with his lowest OPS (.810) since 2011 and his highest K% (22.8) since his rookie year back in 2005 and was shipped off to Seattle during the offseason. He just turned 36 years old, so he’s an injury risk even if he plays DH a lot. He had a .308 OBP outside of Progressive Field last year and is now set to play in Safeco Field, which is far more pitcher-friendly, so he’s a real threat to bat in the .230s this season. Once among the most durable workhorses in baseball, Bumgarner has missed a bunch of time over the last two seasons, although both injuries were certainly fluky (a dirt bike accident and a broken pinkie suffered by a comebacker). More concerning is his diminishing stuff when on the mound, as last year he posted his lowest K% (19.8) and highest WHIP (1.24) since his rookie season in 2010 and the highest BB% (7.8) of his career. It’s all an alarming recipe for a pitcher with a lot of mileage on his arm and declining velocity. Moreover, if Bumgarner is traded — a real possibility despite his hero status within the organization given the stage of his career and the Giants in full rebuild mode — it will be a major blow to his fantasy value. Since 2015, Madbum has a 3.89 ERA on the road (330.2 innings) compared to a 2.15 ERA at home (355.0 innings), so moving outside of AT&T Park could be devastating. A move to the American League could be borderline catastrophic. It’s always nice getting a second baseman who’s actually playing a less taxing corner position, but you’re paying for a someone coming off a career year at age 32 (which is especially crazy given he had a .576 OPS in mid-May). This is more about cost and not paying for last year’s stats when it comes to Carpenter. He’s going more than 100 spots ahead of Jonathan Schoop, who can provide similar power (also with no speed while hitting in the .250s). His odd career continued last year, when he hit .248/.331/.399 before getting traded to the Rays; Pham then finished the season batting .343/.448/.622. Despite his weirdly timed production, there’s little questioning Pham’s hitting ability anymore, but I’m fading him thanks to injury concerns. He’s never reached 500 at bats in a season during his MLB career, as he has a laundry list of injury history (including an eye disease that could affect his future vision) and has been sidelined throughout spring with ongoing shoulder soreness. Pham shouldn’t be drafted before Yasiel Puig. Offensive numbers throughout baseball in 2017 deserve an asterisk, and Andrus’ career-year stands out, when he knocked 20 homers without ever reaching double digits in any of his other nine seasons in the league. The 30 year old stopped running last season too, as he stole just five bases after never not eclipsing 20. His ERA should bounce back this season (assuming his ugly spring stats aren’t health related), but with his veteran status on a team unlikely to make a playoff push, Giles is a candidate to be traded midseason, and that obviously carries risk that he won’t close. He’s an elite pitcher in a situation that should produce a bunch of save opportunities, but Doolittle has never thrown 70.0 innings in a season during his career, not reaching 55.0 in any of the past four. I’m avoiding him and teammate Stephen Strasburg (the first year I’ve quit him) at their costs thanks solely to durability concerns. The Nationals also play in an underrated hitter’s park, as only Coors and Chase Field have increased run scoring more in the N.L. over the last three seasons.